even today in the age when Sony has many times-fold went AND came ‘Back To The Future’, a picture of Winter home in rural Japan envisions flooring blocks of tatami made of rice straw, atop where lays a /sitting/ table – multi-purpose for work-at-home as well as family dining – covered by a warm blanket . 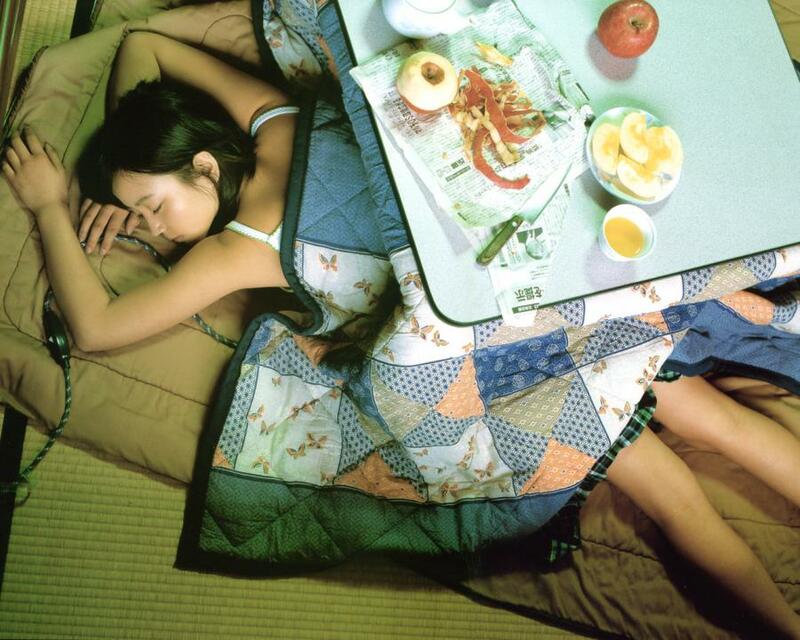 long-called Kotatsu, this small table has a bright electric heater underneath to warm your legs AND family . one of the most serene naps can be had under in a quiet Winter day in the Japans . good-for-thought, for aside from the Northern regions of Senda AND Hokkaido, Japan has a mild weather : pretty HOT AND humid in the Summer but of a mild Winter . now glide over your map North-West to the Korean Penninsula where the Winter is more harsh commonly going under -10 Celsius with more extremes in North Korea, ditto politically AND the state of military in one of the last dictatorial regime on Planet Earth circa 2010 . here home heating has been the floor with historic remains from 5000 B.C. and shown in murals from 4 A.D. relatively modern ondols of the last thousand years used very efficient means : the furnace right outside the room was used for cooking and when done the top was covered (with metal) to allow heat to pass into a hole connecting into the room floor . though initial burning material were straws and wood, modern times enjoyed cheap coals emitting mighty dangerous carbon monoxide, and the death resulting NOT uncommon . 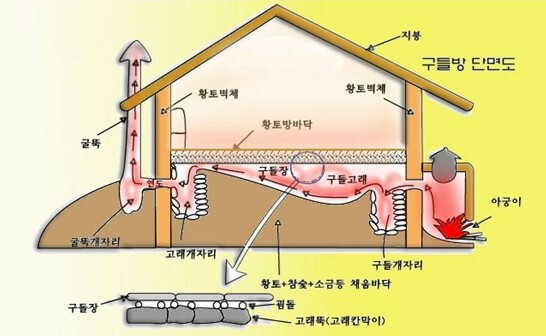 post-war development of the Republic of Korea can be seen on eventually switching the source to relatively expensive-but-safe oil in 1970’s, heating circulating water and from 1990’s more affordable gas . gas safety inspection occur every other month nation-wide and is considered quite safe today, although tap-water inspection done in Europe is unheard of here . 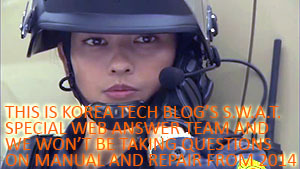 drinking tap water has NEVER been the norm in South Korea . – MinBak means “staying over in a private house” so you rent a room in a family household . families that do this for a living would have most of their rooms rent out and might even serve meals for their tenant students . – GoShiTel : ‘GoShi’ means exam. and ‘Tel’ from hotel (or rather motel), thus crammed tiniest single quarters barely enough space for a desk and futon (blanket mattress to sleep on the floor) . where /ideally/ a lone high school graduate would come from the country-side to study HARD for the notoriously strict (entrance is HARD while graduation is lenient) college entrance exam. in South Korea . usually shared bathroom AND/OR shower with others on the same floor, perhaps some with shared kitchen OR meals prepared by the owning family for extra cost . this is usually in a dedicated building 12-stories high but NOT very wide . – One Room explained here-in WITH individual bathrooom AND shower combined, AND a tiny kitchette : is essentially much smaller than a studio apartment in the States . usually in a 5-story building . – Villa is a smaller apartment than those of the modern ‘apartment complex’ hype characteristically 2~3 stories high with only one or a few duplicate complexes facing each other . this was easy to constuct : simply embed the electric heating panel on the floor of each studio apartment with a temperature controling knop on the wall . however because electric bill is HIGH (on domestic living quarters, while office space gets substancial discounts) the control would NOT work from 8/9 a.m. ~ 11 p.m. or midnight . and come midnight the electric company will start sending low-powered heat until dawn . this will slowly AND gradually start heating the panel or in the latest models : ‘health rocks’ which will remain heated barely onto the next day . thus you cannot suddenly turn OFF the heat but have to make up your mind the day before . monthy bill for a tenant would roughly come up to W15000~35000 for mild warmth settings .